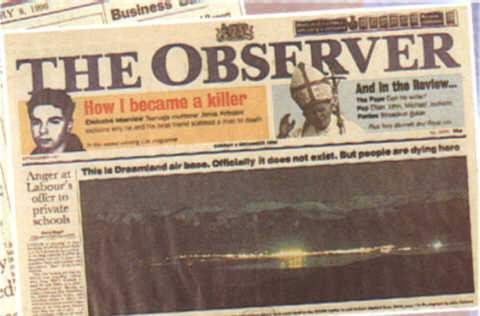 A phenomenon of modern UFO research and folklore is the concept of a "Conspiracy Theory" involving a Shadow Government or a secret high powered military organization prepared to collaborate with an "alien power" , presumably to further its own ends and ambitions whilst putting aside that which would be described as normal morals or ethics. This idea seems incredulous but has any similar form of organization existed in modern history? Has there been an agency structure that could provide a "blue print" for such an organization? Perhaps the Counter Intelligence Corps. (C.I.C.) a branch of the U.S. Military could be said to comply with the above description in many ways. On New Years day 1942 the Corps. of Intelligence Police was re-named the Counter Intelligence Corps.. Originally based in Washington D.C. the headquarters of the C.I.C. were relocated to larger premises in Baltimore. The mission of the C.I.C. was to provide effective counter - espionage , counter - sabotage and counter subversive security. Agents could exercise imitative to "the fullest extent" . Agents also " could resort to any means or stratagems necessary" to accomplish the mission assigned. It must be said that the keyword of the C.I.C. at this time was "Loyalty to country " and British Intelligence described them as " the most deadly sabotage team in history". The C.I.C. was a very private organization. Agents wore plain clothes and when in uniform carried no identification or badge of rank. Reports from other parts of the Military complained that the C.I.C. telephones were not listed and the location of their offices kept secret. The C.I.C. was also an elitist organization, lower ranks often had higher I.Q.s than the average army officer. One team of 20 was found to have 27 university degrees , including several doctors of philosophy and a private who was a master of arts. Agents of the C.I.C. enjoyed extraordinary powers , far beyond their rank or status including unlimited powers of arrest. They existed behind a smokescreen of secrecy . This caused alarm amongst the conventional regimented sections of the Military. However, by 1945 the activities of some of the lower ranks of the C.I.C. were causing concern . For example , a C.I.C. staff sergeant was absolute ruler over Bensheim (Germany) . He lived like a lord in a luxurious villa whose German owner he had evicted, driving through the locality in a white 1938 Mercedes Benz with a German girlfriend on his arm. Another former agent remarked - " We lived well amongst ruins and starvation . We wined and dined and enjoyed the most beautiful women. Agents also employed German personnel to carry out investigations etc. - even former Nazis were writing reports and entire C.I.C. offices controlled by Germans ( having access to Top Secret reports , information etc.). The C.I.C. was also involved in the Korean War but by the 1960s had become more interested in Civil unrest and disapproval of the war in Vietnam. At this time C.I.C. agents were more likely to be found on university campuses - indeed the C.I.C. was apparently disbanded when the full extent of its domestic activities was revealed. Is there any evidence to suggest that C.I.C. members were later to rise to positions of great power? Well, the C.I.C. staff sergeant who so enjoyed the good life (see above) was Henry Kissinger , who later became Secretary of State under President Nixon. Without doubt Kissinger graduated from staff sergeant to one of the Worlds most powerful men. Was there any real evidence that the C.I.C. "made deals with an alien force" ? - - - it was revealed by College Professor Erard Debringhaus that Klaus Barbie , Nazi war criminal , was a full time , salaried informant of the C.I.C. Is there any suggestion that a C.I.C. agent could be involved with any other covert organization ? J.D. Sallinger was also a member of the C.I.C. ( not the O.S.S. as many believe). Who was J.D. Sallinger ? He went on to write the American classic novel "The Catcher in The Rye" . A book that is reputed to have close associations with MKULTRA . At the end of the 2nd World War in 1945 the most valuable treasure "looted" out of Germany was a group of Nazi rocket scientists which was spirited away by U.S. secret agents in what came to be known as "Operation Paperclip". The most famous of these rocket scientists was Vernher Von Braun - a Nazi war criminal who traded his scientific knowledge for U.S. citizenship and truly enormous research and development budgets. Von Braun was quoted as saying The British could not afford us, The Russians terrified us, so we went to the Americans". Von Braun [ left ] joined the Nazi party in 1937 and then the S.S. in 1940 - he definitely was not a "simple scientist with no political beliefs" but was a murderous fascist who was prepared to spill the blood of innocents in order to fulfil his own ambitions. Werner Von Braun in 1947 - NAZI scientist taken to the U.S. to continue V2 Rocket research. Initially Nazi rocket research was carried out using "slave labour" at Peenemunde but when Allied bombing raids destroyed this site research facilities were moved to Dora - Mittlebrau , a series of underground , impenetrable caverns. Over 60,000 slaves worked round the clock at gunpoint converting the former calcium sulphate mines, the whole place being a vision of Hell to the unfortunate workers - many of whom came from Buchenwald Concentration Camp. Most feared of the caverns was Gallery 39 - the galvanizing shop - where very few lived longer than two weeks, their lungs disintegrating in the toxic fumes from the metal treatment plant. 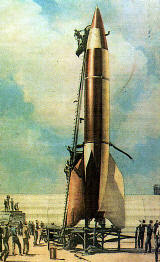 The V2 Rocket - the most desirable technology at the end of W.W.2 . There was almost no relationship to the V1, which was a crude pilotless aircraft. The V2, however, weighed nearly 12 tonnes and was powered by a liquid oxygen/alcohol mixture. Any infringement of the rules resulted in the same penalty - death by hanging - many of the survivors of Dora - Mittlebrau remember such days as when Von Braun noticed damage to the guidance system of a number of rockets. He immediately ordered twelve workers to be hanged as a warning to others. In a little more than 18 months Von Braun witnessed over 20,000 men die in the terrible caverns of Dora - Mittlebrau. Obviously the success of N.A.S.A. and the U.S. space program is based on the expertise of Von Braun and his Nazi cohorts - in fact Von Braun was awarded the Congressional Medal of Honor for his services to the Apollo Space Program but ,however, he was also involved in the development of missiles for use in the deployment of nuclear warheads and the U.S. Black Budget Program - mainly taking place at Area 51 in Nevada. The ruthless, self seeking attitude of Von Braun is still evident at Area 51 as was proved in 1987 when civilian worker Robert Frost came home ,screaming in pain and fear. This man and several other workers had been affected by mysterious chemical fires at Area 51 - two years later he was dead. NAZI Scientist Arthur Rudolph [ left ] was recruited to work for the U.S. space programme but was called to account for his actions in WW2. Rather than admit to employing a NAZI war criminal, the U.S. stripped him of his U.S. citizenship and took back his Congressional Medal of Honor. He was returned to Germany! The U.S.A.F. will not accept responsibility for the injuries and deaths related to Area51 on the basis that the facility does not officially exist. 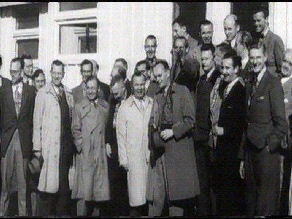 Surely the similarities of the German rocket base and Area 51 -both involving underground facilities, both involving the highest degrees of secrecy and both being oblivious to even the most basic of "human rights" shows that the attitudes of such men as Von Braun [ right ] have survived down through the years and have been developed into a terrible philosophy that supports a ruthless group of men - men in positions of great power .These are the men whose activities are kept secret from other high ranking military officers and politicians, these are the men who are a law unto themselves - men who follow the concept that " Morality is not an issue. Vernher Von Braun - a Nazi war criminal who was awarded the Congressional Medal of Honor! The United States is planning to take control of parts of space and develop patrolling military aircraft in orbit as part of a revived Star Wars proposal for an American military empire above the ozone layer. According to James Roche, the US Air Force Secretary, America's allies would have "no veto power" over projects designed to achieve American military control of space. The plans come after the successful use of global positioning satellites (GPS) and other space technology during the recent wars in Afghanistan and Iraq. The National Reconnaissance Office (NRO), the intelligence agency that is responsible for US spy satellites, is to develop a strategy that ensures America's allies, as well as its enemies, never gain access to the same space resources without Washington's permission. Recent proposals that have been circulated at Space Command and NRO briefings suggest that access to "near-earth space" may be refused to other nations. All GPS satellites are located within near-earth space, which covers the orbital distance from Earth to the moon. A fleet of spacecraft will be developed, designed to attack and destroy future satellites of enemies and rivals. The rapid-launch "military space plane," the potential cost of which has not been disclosed, would also be used as a mobile "bodyguard" for US space installations. It would be the first "space plane" in history with a directly military function. A prototype is expected by 2005 although military deployment is not expected before 2014. "It will hopefully be a new kind of vehicle, equipped for the challenges of the future," said a Pentagon official. After the recent military action in Afghanistan and Iraq, US Air Force Command claimed that American forces on the ground had a decisive advantage in gathering intelligence and targeting enemy troop positions. As a result, the Pentagon believes that the struggle to control space will form the next stage of a global arms race. Its plans confirm that America expects space to be "weaponised" in the medium-term future, and is determined to take an unassailable technological lead. Two years ago, a report commissioned by Donald Rumsfeld, the US defence secretary, warned of the danger of a "Space Pearl Harbor" if America did not take action to protect itself. At America's National Space Symposium, held in April in Colorado Springs, Gen Lance Lord, the commander of US Air Force Space Command, explained the logic of the new strategy to a largely military audience. "The pursuit of asymetric advantage is not new," he said. "In the 20th century, airpower emerged as just such an advantage. Today, at the outset of the 21st century, we are realising the same sort of advantage through space power." It was at the same forum that Mr Roche warned America's allies not to expect any veto over its plans. Until now, international treaties have forbidden the deployment of weapons in outer space, although a loophole exists which allows the United States to use its satellites for military intelligence. The 1967 Space Treaty - the first international legislation on space exploitation - also stated that outer space should be free for exploration and use by all states, and would not be subject to national appropriation by occupation or any other means. Last month, the Russian foreign minister, Sergei Ivanov, repeated Moscow's demands for the complete demilitarisation of space. In March last year, however, Peter Teets, the under-secretary of the air force and director of the NRO, said: "I believe that weapons will go into space. It's a question of time. And we need to be at the forefront of that." A Department of Defence Review in 2001 also stated that "a key objective [for the US] is not only to ensure US ability to exploit space for military purposes but also as required to deny an adversary's ability to do so". Canadian government officials have already complained that senior American officials have begun to exclude them from sensitive areas of joint aerospace defence operations. The implications of an American military monopoly in space are bound to concern European allies, who have recently agreed to launch their own $3.2billion satellite navigation system - Galileo - which is to be used only for civilian purposes. Europe has long resisted the prospect of a military use of space technology. In the 1980s, Ronald Reagan's Strategic Defence Initiative - the so-called "Star Wars" plan - to use space technology to repel Soviet missiles, ending the era of nuclear deterrence, drew fierce resistance from allies. President George W Bush's plans for a satellite-guided missile defence system have now largely been accepted.